Christian and Muslim leaders gather in the Iranian capital to discuss dialogue, extremism, violence and security. Cardinal Onaiyekan stresses the importance of practical actions and political decisions in the interests of peace. Iraqi Sunni leader: United to counter the radical ideology. Ayatollah Mohaghegh Damad: Iran a land of dialogue that promotes friendship between Christianity and Islam. 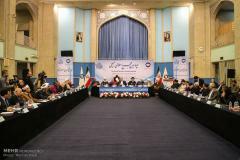 Teheran (AsiaNews) - To strengthen inter-religious dialogue, combat fundamentalist ideology at the root of war and violence, relaunching the peace projects involving personalities of all faiths in a common path of encounter and discussion: These are some of the objectives outlined in the fourth Christian-Muslim Summit, which was held in Tehran (Iran) from 6 to 9 November. The meeting, which was widely reported on Iranian media, was hosted by the International Center for Interfaith Dialogue, which belongs to the Organization for Islamic cultures and religions. The theme of the 2016 summit "To respect and preserve human dignity, setting the stage for peace and global security." The event – which was previously held in Washington (2010), Beirut (2011) and the Vatican (2014) – was attended by prominent Christian figures (Catholics, Anglicans, Protestants) as well as notable Muslims (Sunni and Shia) coming from Iran, Iraq , Lebanon, Nigeria, the United States, the Vatican and Hong Kong. The Catholic Church was represented by Cardinal John Onaiyekan, Archbishop of Abuja. In his address the cardinal, representing a nation of almost 170 million inhabitants divided in half between Christians and Muslims, stressed the "coexistence" between faiths in Nigeria, although "there are sometimes clashes." However, encounter and dialogue are "the best solutions in the eyes of God to solve the problems." People "want peace," stressed Cardinal Onaiyekan, and “many are working hard to realize this goal, such as these people who are present in this meeting and certainly this summit is one of those steps that are taken in the world to lead humanity to peace". The archbishop of Abuja continued: "Although some believe that these efforts are useless and without results and waste of time and money, they should be told that this group should be trusted and we should believe that the continuation of these meetings will certainly lead to global peace. However, we should not think that these talks are enough, but we should take action and even make political decisions in this regard". Abouzar Ebrahimi Torkaman, the head of the Islamic Culture and Relations Organization, which hosted the event touched on the issue of violence in religions, emphasizing that it "is not rooted" in it but "is generated by ignorance" of precepts of faith and "irrationality". He added: "Networking is one of the important goals of these meetings. If we could not fulfill the decisions that we have taken in these meetings by a network of interested and leaders, not serious results will be achieved and will be more of the same kind as that Ferdowsi, the great Iranian poet, said a thousand years ago: they sat, said and stood"." Finally, to combat extremism, he said that education and the educational process in schools must be addressed. The Ayatollah Taskhiri, among the closest collaborators of Khamenei for matters relating to the Muslim world, urged religions to commit to the path of dialogue on an equal level between members of different religions. We must not forget, warned the Shiite leader, the value of interreligious dialogue in the interests of peace and security "as it is written in the Koran." Sunni Sheikh Mahdi Sumaidaie, General Mufti of Iraq, emphasized the problem related to extremism and the ideology of takfirism, which has caused much bloodshed not only in his country, but in many areas of the world. He called for joint efforts of Christians, Muslims and Jews to reinstate a peaceful coexistence, which has happened and is still happening not only in Iraq but also in other parts of the Arab world and the West. "Tackling takfirism – he said – means confronting fundamentalism, and those who say that it is permissible to kill." "Some criticize the Sunni leaders who remain silent in the face of extremist violence - said the mufti - but it is not true, because we make our voice heard [...] and we invite all to work for peace." Finally Ayatollah Mohaghegh Damad, head of the department of Islamic studies at the Academy of Sciences in Iran recalled that the country has always been "a land of dialogue" and this has favored the "working revision" of the precepts of the faith in the context of the summit. A task carried out "without prejudice" and based on the value of the "dignity" of human contained in the scriptures. Addressing the media, he has asked them to spread "the message of peace" which is at the base of the summit; it is founded on the values ​​of "friendship, reconciliation and love" that bind Christianity and Islam "over the centuries and for years to come."